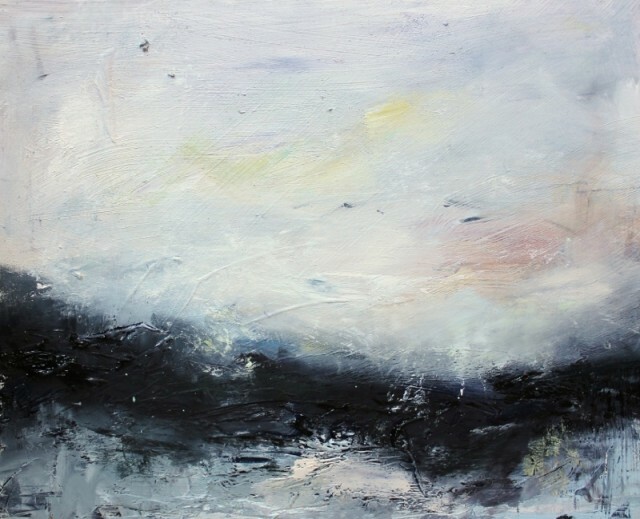 Originally from Suffolk, London-based artist Georgie Mason specialises in semi-abstract landscape paintings. Usually beginning to paint from a certain point of a blank sheet of board and working outwards, Georgie’s ideas develop as she works. Her initial vision, taken from photographs or even just a memory itself, may be completely overridden as she continues to add marks. Though working mainly in oils, her passion for finding new and interesting textures has often led to her own experimentation with different media, such as splashing watercolours over oil, or scratching through oil to reveal acrylic below. She uses her fingers as well as traditional brushes to apply the paint, but also finds more exciting and unexpected textures come from toothbrushes, strips of cut cardboard, and cloths. Inspired by memories of her own travels, particularly in Japan, Thailand and Vietnam, Georgie aims to capture the feeling of a place as she remembers it. Her main focus is for the painting to have its own personality and evoke an atmosphere, something that comes from her enjoyment of creating the work itself. Her own mood will always affect the end result, too. If she really enjoys the process of creating a piece, the chances are she will be happy with it. As well as taking regular commissions since her Art Foundation in 2010, Georgie has had her work in exhibitions around the UK and internationally. These include ‘Out from the Net’ at The St. Edmundsbury Cathedral Gallery, Suffolk, ‘Joie de Vivre’ at Lavenham Hall Gallery in Suffolk and the London and the Amsterdam Coffee Festivals. She has been shortlisted for the Royal Bath and West Society Scholarship and recently won the Young Artists’ Prize in the Bath Society of Artists Annual Exhibition. Her work is currently on show at Foss Fine Art, Battersea and future exhibitions include the Summer Exhibition at The Aldeburgh Gallery in August, The Cambridge Art Fair in October and a solo exhibition at Lavenham Hall Gallery in Spring 2016.